When my whole family gets together, we usually order Chinese for dinner. I’m the oldest of five siblings and things can get a little hectic when we’re all in the same place at the same time. Although I love cooking for my family, it can be hard to please everyone. Chinese seems to do the trick because there’s something for everyone. We even have it for dinner on Christmas Day – it’s become a tradition. For as long as I can remember, my favorite dish from the Chinese food menu has been pork-fried rice. I love the peas, stir-fried scrambled eggs, and the soy sauce soaked rice. But it’s a treat for me, usually something I only eat when ordering in with my family. The take-out version usually has way too much sodium and the rice to vegetable ratio is less than ideal. To fill my craving for pork-fried rice, I recreated the recipe myself. As I’ve mentioned before, I love recreating take-out meals. It’s a challenge to make something healthier and tastier than the restaurant-prepared version. When you cook for yourself, you get to control everything that goes into your meal. When making this recipe, I deliberately went easy on the salt and soy sauce and added tons of veggies. It takes all of the guilt out of eating your favorite take-out meals. Oh and guess what? Cooking it yourself usually makes it cheaper. And personally, I think it tastes better. What’s your favorite take-out meal? Have you ever tried recreating it? Cook 2/3 cup quinoa according to package directions, replacing half of the liquid with low-sodium chicken broth. Combine 2 tablespoons flour, ¼ teaspoon salt and ¼ teaspoon pepper. Toss 1 pound chicken in the flour mixture. Heat 1 tablespoon vegetable oil in a fry pan over medium heat. Fry the chicken until just cooked, about 2 minutes per side. You’ll know the chicken is ready to flip when it easily comes off the pan. You might have to do this in batches depending on the size of your pan. In a separate, large pan (preferably with taller sides) heat 1 tablespoon vegetable oil over medium heat. Sauté 1 cup diced onion about two minutes. Add 1 cup diced red bell pepper and sauté for an additional 2 minutes. Add 1 cup shredded carrots and sauté about 3 more minutes. Finally, add 1 cup frozen peas. When the chicken is finished, add 1 teaspoon vegetable oil to the pan and heat again. Add two large eggs, and cook until scrambled and cooked through. Break into small pieces. Add the quinoa and egg to the vegetables and stir to combine. Add 2 tablespoons soy sauce and serve warm. Yield: 4 servings. Per Serving: $3.22, 439 calories, 15.5g fat, 36g carbs, 39g protein. 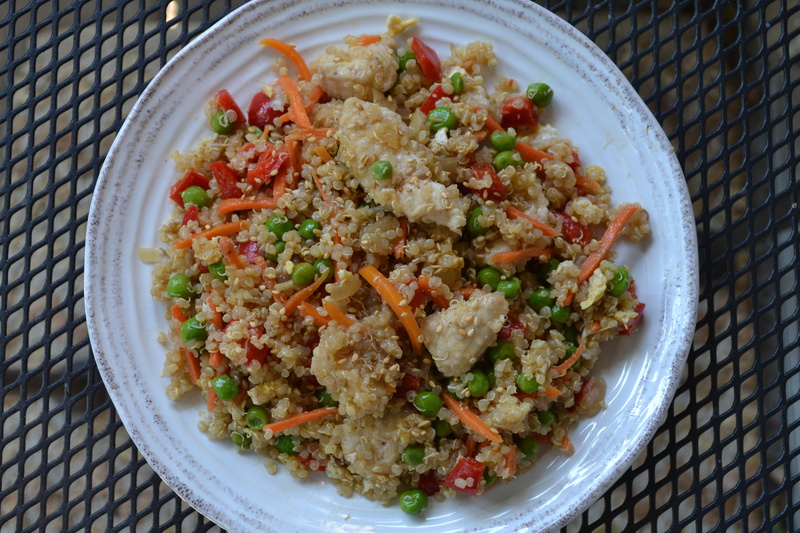 This entry was posted in Chicken and tagged chicken, chinese, fried rice, quinoa, vegetables by cooklikekayla. Bookmark the permalink.